In the polarizing climate of 2018, even some entertainers are viewed through a political lens. Vocal black celebrities, advocates for the LGBT community and white conservative pundits are the most politically divisive figures on the Forbes 100 list of the world’s highest-paid entertainers, according to a new survey. Morning Consult asked 6,609 U.S. adults their opinion of celebrities such as the singer Pink and comedian Kevin Hart. The most popular figures are actors Dwayne Johnson, Will Smith and Jackie Chan — all racial minorities who have largely refrained from using their platform to make political statements. Beyoncé Knowles and Jay-Z, who endorsed Hillary Clinton in the 2016 presidential election and performed during one of her campaign rallies, are among the most divisive figures on the list. The Sept. 5-9 survey, with a margin of error of 1 percentage point, found that Democrats have a net +63 favorability of Knowles while Republicans’ favorability came in at net -3, creating a gap of 66 percentage points. She is the most politically divisive entertainer on the Forbes 100 list. Only two of the top 25 most politically divisive celebrities were more loved by Republicans than by Democrats: conservative hosts Sean Hannity and Rush Limbaugh. Both men have taken controversial stances, such as Hannity’s repeated attacks on special counsel Robert Mueller and Limbaugh calling the 2016 Women’s March a “Deranged Feminazi March.” Democrats have negative views of Hannity and Limbaugh (net -37 and net -44, respectively), while Republicans’ views are move positive but not necessarily enthusiastic, with net +28 for Hannity and net +17 for Limbaugh. LeBron James, who has called President Donald Trump a “bum” and said the president is dividing the country, is the fifth most divisive figure, with a 50-point gap in net favorability between Democrats and Republicans. Ellen DeGeneres, the fourth most divisive celebrity on the Forbes 100, has a net +19 among members of the Grand Ole Party — but Democrats have a very high opinion of her (net +75), resulting in a large net difference between both parties. DeGeneres, along with Lady Gaga, who also appears on the list, are two prominent figures in the LGBT community. Lifting up the rights of LGBT individuals is an important part of Democrats’ platform, and LGBT individuals overwhelmingly vote Democratic. 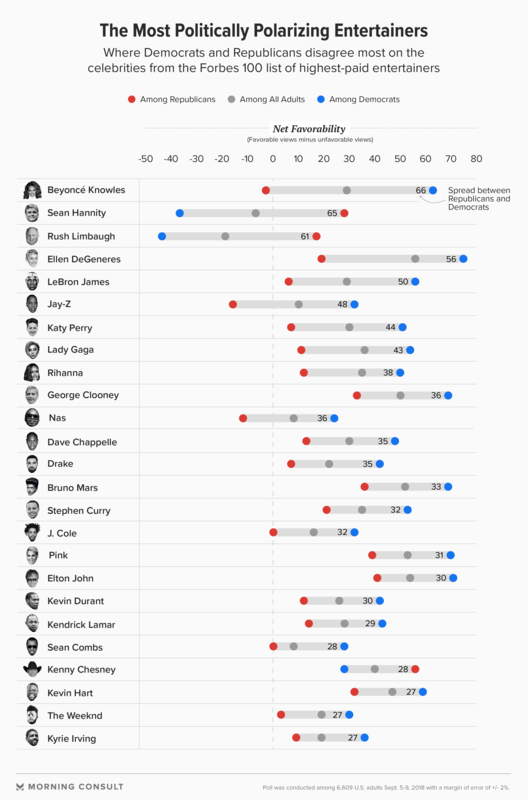 Unlike DeGeneres, Jay-Z is divisive not because he is overwhelmingly well loved by Democrats (with whom he has +32 net support) but because Republicans hold low opinions (net -16) of the rapper and producer. 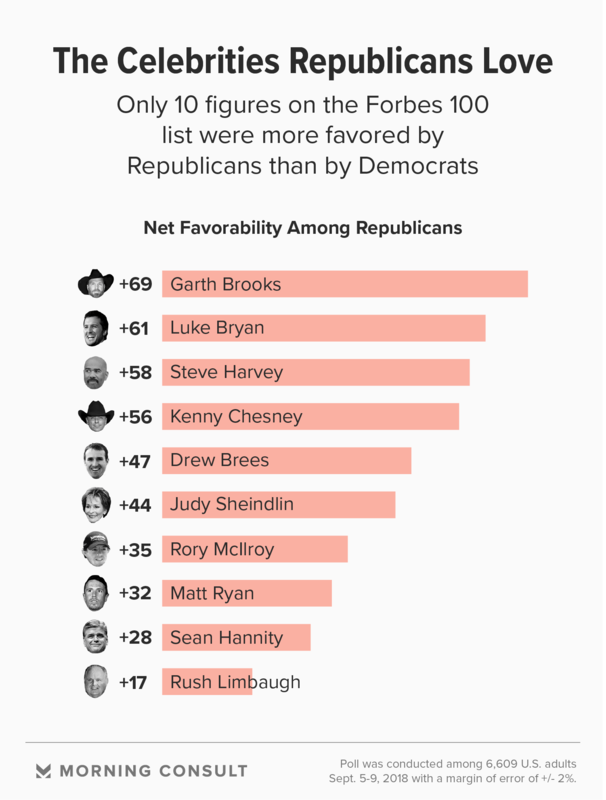 Democrats tended to have higher opinions of Forbes 100 entertainers, ranking them at net +38 favorability on average, while Republicans gave the 100 names a favorability of net +24. This could be tied to the fact that Americans perceive Hollywood as more liberal compared to the country as a whole. Of the 100 names on the list, only 10 figures were statistically more favored by Republicans than by Democrats, including television star Judy Sheindlin, or Judge Judy, and National Football League quarterbacks Drew Brees and Matt Ryan.